On Monday we start our ‘Main Shearing’ this is our big shearing time of the year where we shear the bulk of our sheep. We are shearing at 3 different sheds and we’re starting at our lease block up north. This means that this year the whole family is packing up and heading north to check it all out and lend a hand where we can. Last year I was running a course so I missed out and Muddy Hubby stayed back here to look after the Muddy Kids so he missed out too. I am constantly amazed at how much stuff I have to pack as a Mum. I am an ‘overpacker’ from way pack always throwing in ‘just in case’ items half of which I never end up using. As a Mum though I’ve had to learn to economise on the packing due to the limited space in the car. I have 2 outfits for each Muddy Child, one for each day, PJ’s and one spare outfit ‘just in case’ (I can’t help myself!). We’ll hit the road in the morning and have some time to explore the town with the Muddy Kids before heading out to the shed to make sure all is in order for Monday morning. I think I am most excited about not having to cook dinner for TWO nights in a row. We get to partake of one of the two restaurants in town to fill our belly (and they’re BIG meals they serve up). How we’ll go sharing a room with all the Muddy Kids I’m not sure, we may all be coming back more tired than when we left. 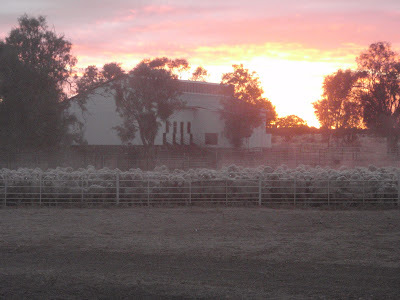 The shearing North will take just under 2 days depending on how fast the shearers go, we’ll then start at the second shed on Wednesday and this should be 2 days as well, my Muddy Father-in-law will be back here to help get the shed ready before we get back. Finally on Friday we’ll move to the big shed and finish off the bulk of the sheep in just over a week depending on how fast the shearers go. It’s an exciting and busy time for us, most of the family is in the shed at some point, Muddy Hubby is already training the Muddy Kids to pick up the bellies and they’ve got little brooms to help sweep the floor. Lucky for my Muddy Organiser it’s in school holidays so she won’t miss out. What have you got planned for your school holidays? This entry was posted in Family, Farm, Muddy Organiser on June 30, 2012 by nat. Wow, sounds like a great adventure, lots of hard work I’m sure, but I bet the kids will love it!